Communication relies on safely and efficiently sending information from point A to point B, no matter how far apart those points may be. A new federal grant will allow Florida Tech to seek ways to improve that process. 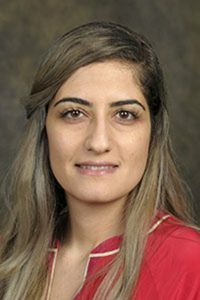 Assistant professor Shermineh Rostami Fairchild’s proposal, “Free-space optical communication in plasma waveguides,” has been selected for funding by the U.S. Army Research Office. This award is part of the competitive Young Investigator Program that provides seed money for full-time young faculty to start their research. The award is for a total of $360,000 over three years. Fairchild said she is proud of the honor, given what the prestigious award represents for young faculty and the work involved in winning the grant. Fairchild is one a few specialists in laser filamentation in the United States. This phenomenon consists of laser beams propagating with low losses and minimal diffraction over kilometers. Filament-induced plasma channels could be engineered into free-space waveguides to propagate optical information more efficiently. This could lead to a new paradigm in free-space, long-distance optical communication. By the end of the project, Fairchild will apply the concept developed in the lab to real-life conditions for the first time. For that, she will use a high-power mobile laser at the Townes Institute Science and Technology Experimentation Facility, managed by the University of Central Florida at Kennedy Space Center. In her short time at Florida Tech, Fairchild has not hesitated to actively bring together the expertise of faculty and students from different areas and to collaborate with them as she looks to improve laser-based communication. She has come to appreciate the variety of fields offered to the students at FIT.